I’m not sure if I’ve ever suggested using a microwave for anything on this site before. Feel free to do a search if you’re curious. It really is the best way to cook cauliflower “rice” though. I suppose you could steam it if the holes in your steamer are small enough. As for the taco seasoning, I suggest making your own, though you could use a packet in a pinch. Just omit the salt from the recipe if you do. Place the beef, taco seasoning and salt in a frying pan on medium-high heat. Cook, crumbling apart until well browned. Remove from heat. Place the cauliflower in a covered casserole dish and microwave on high for five minutes or until tender. 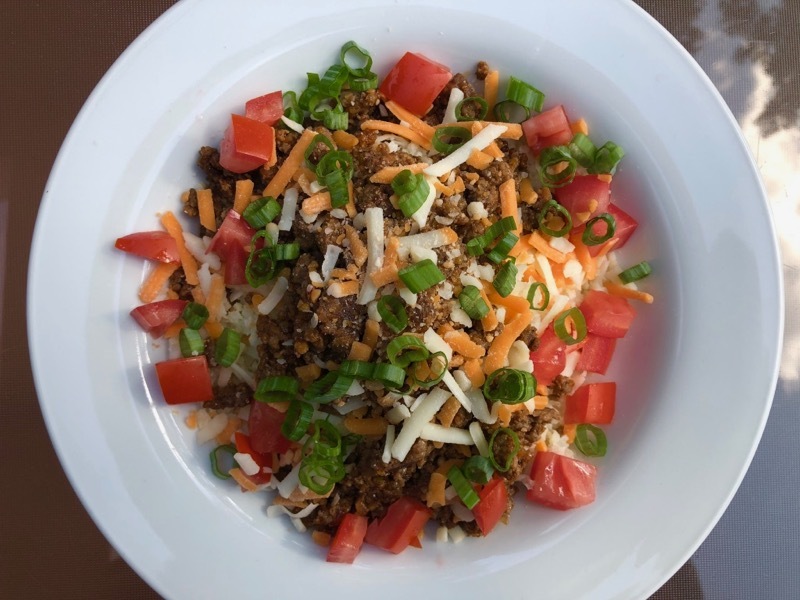 Plate the cauliflower rice topped with the beef, cheese, tomato and green onion.